Celebrating my 27th birthday, my High School best friends asked if I have something to do that Sunday afternoon? I just got home from a trip to Tagaytay with my dad, brother Wilson, and cousin Judy when I said I have nothing going on after lunch. So they told me about their plans of visiting our friend at the hospital in Cavite City and we'll have lunch thereafter. It was quite a talk before we finally decided to have our lunch at Cafe 506. 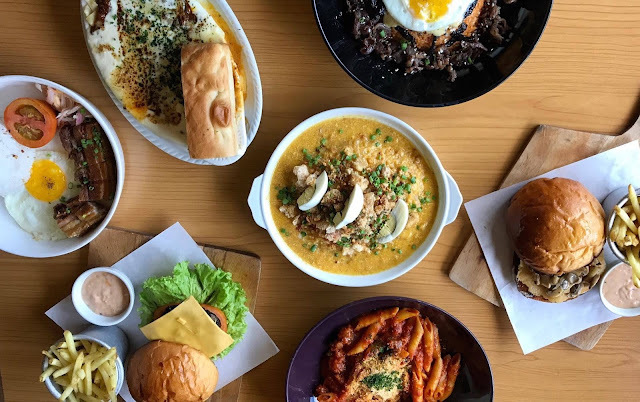 Located at EPZA Diversion Road, Kawit, Cavite, Cafe 506 has a wide array of delicious goodies on their Menu. It was probably my 3rd or 4th visit that time and I can see how they continue to improve and add more dishes to their list. I would have to say that the place feels homey and nice. I'm sure they can further improve the overall feel of the place especially with the lighting. I know how lighting is a challenge for cafes especially during the daylight, if ever they want to let their guests have that certain feel of a cozy ambiance despite the strong sunlight but there are ways I'm sure. My best friend Rjay ordered the Kim Cheese Rice Bowl. This dish is probably their own take on the Korean Bibimbap. Although without the usual vegetables that are present on the traditional Bibimbap, they stir fried the rice on Korean Red Bean paste and rounded it all up with Korean Style Barbequed Beef. To finish it all, Fried egg on top! The taste of the rice is definitely Korean. The red been paste was very present to the stir fried rice and I have to say, the sweetness and saltiness of the beef complimented the dish's overall taste. To be honest, it was a little too tasty for me because I would really like the taste of the beef (especially the fatty parts) to shine through but it has been overpowered by the seasonings of the beef. Now to me, this one is THE BOMB! Their Pancit Palabok, which was my friend Faith's order, tastes perfect for me. Not too bland, but not too salty, which is usually the problem to anyone's Pancit Palabok. This particular dish needs extra care when it comes to the seasonings especially the amount of Fish Sauce that has to go to its sauce. A little more than the right amount of Patis [fish sauce] can turn your Palabok into a bed of salt. But this particular one, I have to say, is seasoned perfectly! The noodles on the other hand is boiled to its correct firmness. If I have to go back, I'll definitely order this one. Our class Valedictorian Ferdie Ray decided on the Pritchon. It is the traditional Lechong Kawali or Deep Fried Pork Belly, served with garlic rice and fried egg. Nothing very special about this dish but I have to commend the correct amount of time it took them to fry this up because it is both cooked well and the skin is perfectly crispy. Our dear driver Myrcel (she's also one of my best friends of course) opted for the cafe's Beef Lasagna. It looks so good and oozing with so much cheese, I mean, who doesn't love cheese? The pasta was cooked perfectly, just like the other noodle dishes we ordered, but here's my take on the taste though. They tend to go on the sweeter side on this one, and I may say, it was too sweet for my liking. For me, if you are to make beef dishes, it is of prime decadence to bring out that natural savory taste of beef. It is a taste that I can only find in beef, which is very crucial as to working on dishes that showcases it. In our family of self-taught cooks, we have a saying that if you don't know how to bring out the flavor in beef, then better to use pork instead (pork is relatively cheaper than beef in my side of the world). Maybe they added too much sugar or the sauce based they used is more on the sweeter side. Over all, it wasn't that bad, but I've tasted a lot of better lasagnas than this one. From a not so good pasta dish, let's move on to another pasta dish. This one is my choice and I have to say, I am proud of what I decided on. Their Longganisa Pomodoro is amazing. The dish was perfect, well, at least for my own set of taste buds. They used Penne pasta on their Pomodoro but they made the dish their own by using Longganisa for its meat component. Longganisa, for those who aren't familiar with it, is a native Filipino sausage. Usually made of pork, it is popularly served fried for breakfast with rice and egg. What makes it different for it's cousin, the chorizzo, is the fact that it's cased slightly loose. Though both cased on sub-mucosa or animal intestine layer, most longganisas are not pressed as tight as the chorizo which is a lot more firmer. Back to the dish, they made their Pomodoro sauce a fusion of all the tastes that we want. Sour from the tomato sauce, sweet from the longganisa, and yes, spiced by Chili! I would not actually recommend this dish to people who hates (and fears) spicy food but to those who love it, oh you have to try this one! Never to forget is the Parmesan cheese sprinkled over the delectable sauce that seals the deal with it's savory goodness. Ate Judy and Marvin ordered their burger entrees served with their homemade shoestring fries and dip. We had a great time at lunch together and we all enjoyed our food. One thing that we love to do when dining out (which others think is weird) is we love to taste all of each other's dishes. It's a way to enjoy the restaurant and to know which dish we will actually order the next time we visit the place with our family or friends. My Birthdays are never complete without spending it with these amazing people! Everytime I add up a year to my existence, I also add up another 365 days of laughter, tears, expeiences, and memories with these amazing set of weirdos friends. 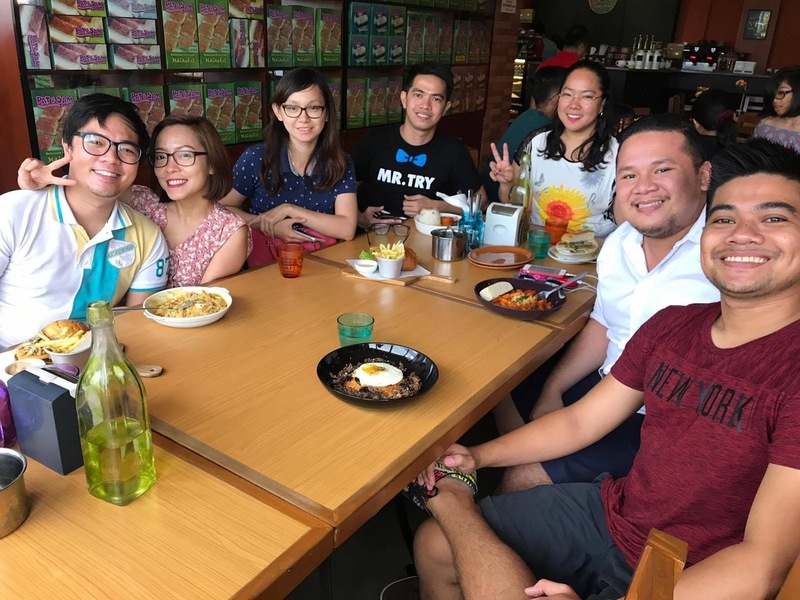 I am now 27 years old, which means I've been friends with these people for almost 23 years now, we've all been classmates since Kindergarten up until we graduated high-school, and we have no plans of breaking any ties for as long as we live.